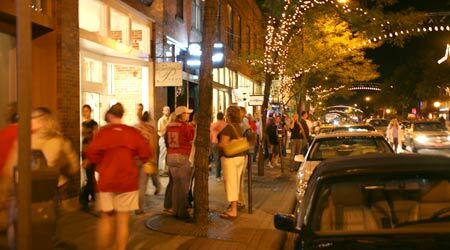 On the evening of the first Saturday of each month, the Short North hosts an informal event known as the Gallery Hop. All of the shops along North High Street in the Short North area are open for visitors to walk-in a see new exhibitions. Since its inception over 20 years ago, this unveiling of new exhibits by the area galleries has become one of the city's biggest regular social events. The Hop is an entity with a life of its own. It ebbs and flows, each month different, depending on the mix of people, weather, time of year, activities, and competition from other venues. It is also always the same: lively, cheap, expensive, visual, audial, tactile, tasty, smelly, stinky, love it, hate it, come early, stay late, feet hurt, where'd we park, and "oh no we're towed" good time. The Gallery Hop attracts blue hairs, both pastel and neon, want to be old, want to be young, bad clothes, great jewelry, prom queens, drag queens, queens for a day, day trippers, families, solos, out of towners, locals, suburbers, slummers, snackers, sneakers and street musicians. Come early and stay late. The Gallery Hop roughly covers North High Street from the shops built over Interstate 670, north to around Hubbard Avenue. The hop happens rain, snow or moon shine-- bring your walking shoes and be careful where you park.